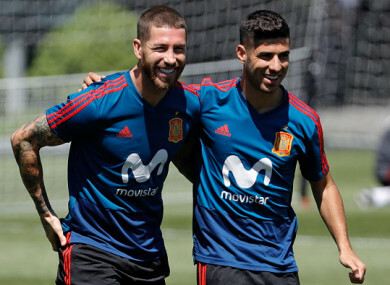 Ramos and Marco Asensio during training in Krasnodar. SPAIN CAPTAIN SERGIO Ramos insists the squad are “together” following Julen Lopetegui’s shock sacking as coach on the eve of the World Cup. Loptegui was removed from his post on Wednesday following Tuesday’s announcement he is to take over as Real Madrid coach. Fernando Hierro has been drafted in as replacement for the tournament, with Spain’s first Group B match taking place on Friday against neighbours Portugal. But Ramos has moved to quell any notion that La Roja’s chaotic preparations for the World Cup have had an impact on the unity in the camp. He posted on Twitter: “We are the national team, we represent a shield, the colours, the fans, a country. Hierro, who won five La Liga titles and three Champions Leagues in a glittering Real Madrid career, has somewhat limited experience as a coach. Hierro has been working as Spain’s sporting director since last November. Email “Ramos insists Spain are 'together' as former Real defender Hierro takes over ”. Feedback on “Ramos insists Spain are 'together' as former Real defender Hierro takes over ”.